Parish Cafe has been around since the 1990’s, however despite living in Boston for seven years and just outside of Boston for five, I never made it to Parish Cafe until recently. Even with the rave reviews, when I finally did get to eat at Parish Cafe, it was at their newer location in the South End, right off of Massachusetts Ave. I particularly enjoyed eating at this location with a few friends because one of the apartments I lived in was right near that Parish Cafe 2. While driving around looking for parking (which can be a challenge), I flashed back to living in Boston and hunting down the best, secret parking spots. After squeezing my car into a super secret spot, I walked down the all too familiar Tremont Street and entered the Parish Cafe for the first time. The interior of Parish Cafe 2 on the corner of Mass. Ave. and Tremont Street is well lit due to the windows that circle the exterior of the restaurant. During the summer, the restaurant opens those huge windows making the place look like an open-air cafe. 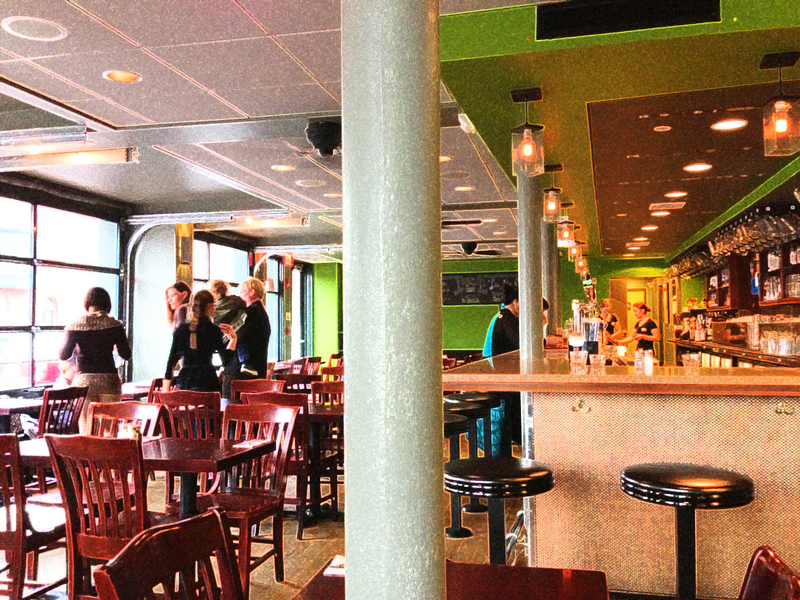 It’s not a huge restaurant, but there is ample seating for a lunch rush as well as a bar towards the back, side wall. Our server was very friendly and accommodating when my indecisive friends and I couldn’t figure out our drink orders at the same time. She went back and forth for us without complaint and gave me some tips about the sandwich options I was curious about. At the end of the meal, she even split our checks with a smile according to our awkward instructions. My friends and I all ordered draft beers to start our meal. One of our friends told our server, “I have a mug.” Then she looked at me and asked, “Do you have a mug?” I looked around flustered at my friend and asked, “Do I have a mug?” That question alone, means, no… no, you do not have a mug if you have to ask. 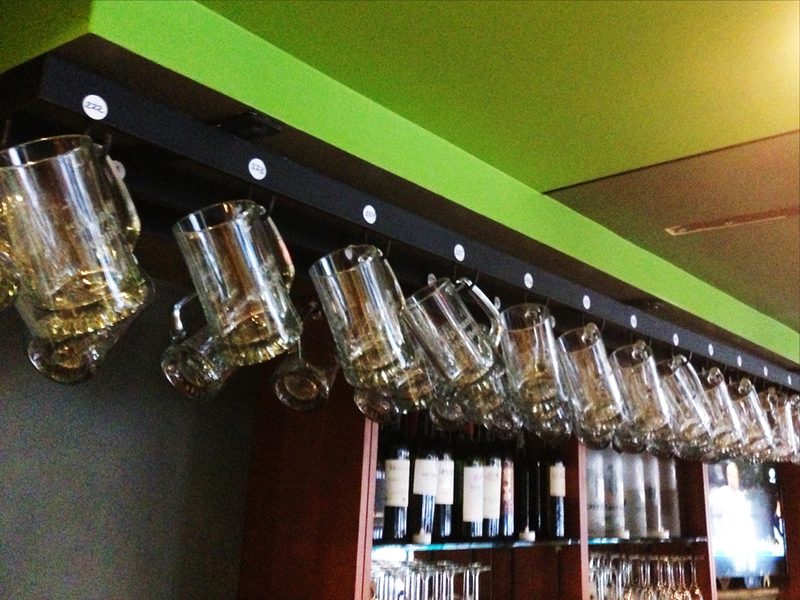 My friend informed me that if a patron of the cafe drinks all 125 beers offered within six months, then that person gets to be part of the “Mug Club.” The perks are that the patron gets a 25 oz., personalized beer mug stored at the bar. The patron can then come in and drink from their own mug each visit. I was very impressed that my friend had one! For lunch, we had sandwiches, which are the main draw of Parish Cafe. 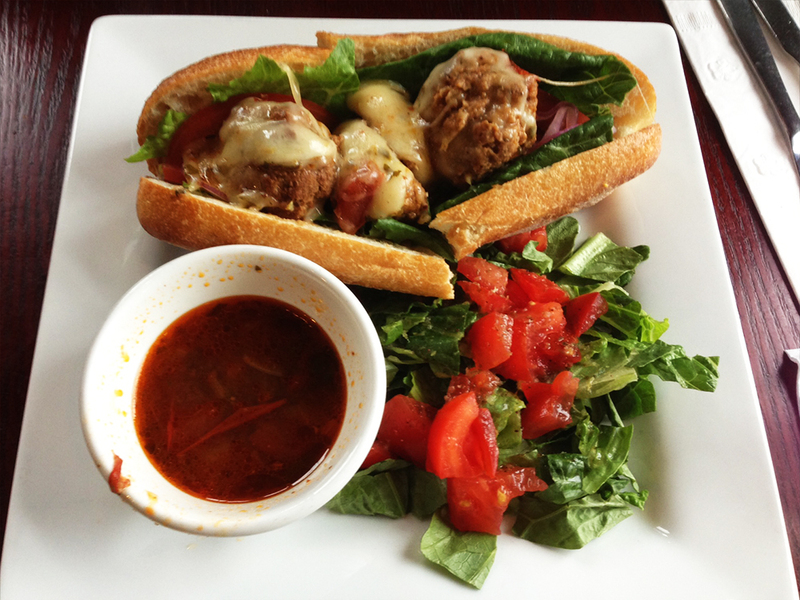 The sandwich menu consists of sandwiches created by chefs all over Boston. Two of my friends ordered the Mexican Meatball and two of us ordered the Zuni Roll. The Mexican Meatball looked very much like a normal meatball sub, but according to my friend, the meatballs had a lot of good cilantro flavor. It was also served with a spicy jalapeno chipotle jou and the peppper jack cheese added a different kind of mild spice to the sub. The only negative for my friend was that he said the bread was a little too thick, which caused meatballs to fall out of the bun when taking a bite. Otherwise, it looked like a great sandwich and received good reviews from my friend. 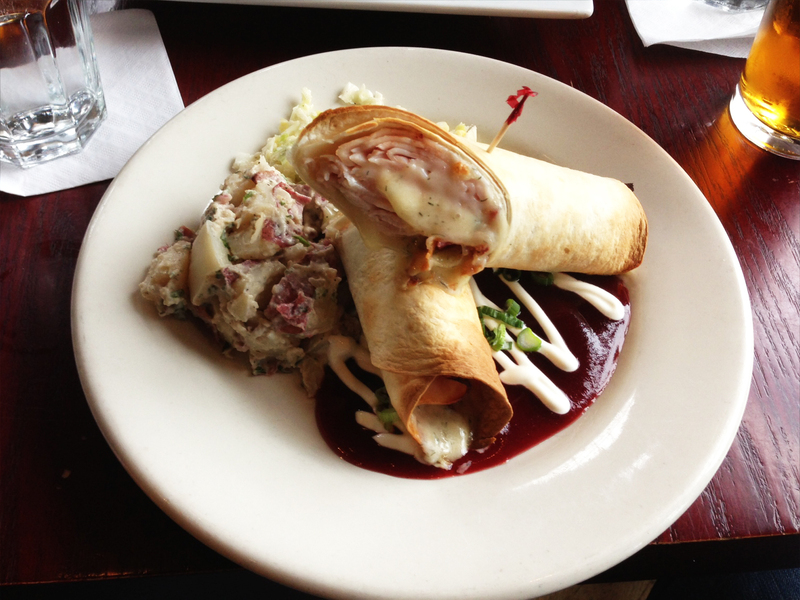 According to our server’s recommendation, I ordered the Zuni Roll (smoked turkey breast, crisp bacon, chopped scallions, dill Havarti cheese, and cranberry chipotle sauce wrapped in a flour tortilla and served warm with a side of cranberry chipotle sauce and sour cream with scallions). I ordered it with a potato salad and cole slaw on the side just so I could try a bit of both sides. The potato salad and coleslaw sides were good, but didn’t really stand out to me. When the wrap first came out, I was a little skeptical because it didn’t look very big. I was also more than a little concerned by the mess of cranberry chipotle sauce all over the bottom of the plate. My fears were put to rest though when I noticed that the roll was placed expertly on the plate so that the sauce wasn’t completely slathered all over the roll. I could see why my friend ordered the sauce on the side though. The roll itself was very dense, so despite being thin, it delivered on hefty flavors. The smoked turkey and bacon went incredibly well with the sweetly tart cranberry chipotle sauce. The roll was perfect for lunch (especially after having a beer) because it is filling without putting a person into a food coma. 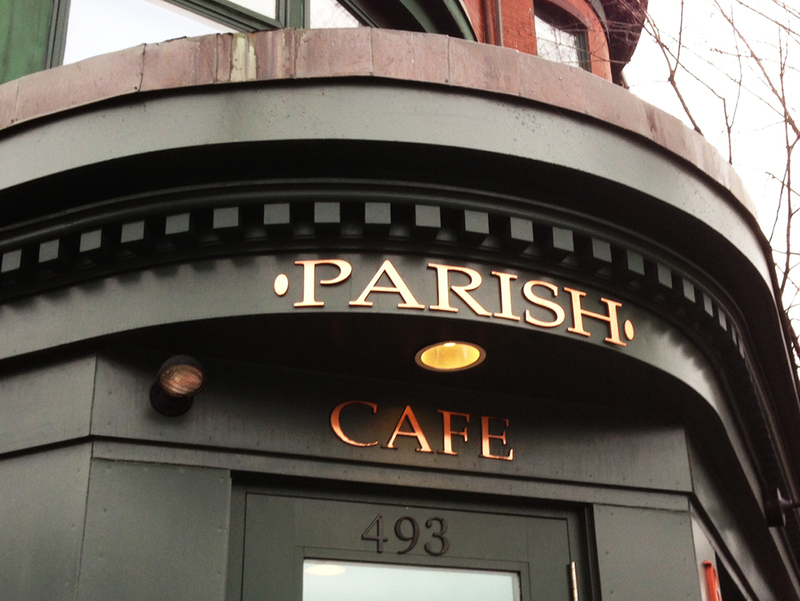 I greatly enjoyed the atmosphere, service, and food at Parish Cafe. This is a great spot to grab a quick lunch with friends during the day and the creative sandwiches created by chefs all over Boston ensure that there is enough variety to keep it interesting each visit.